From Yangon. Myanmar's largest city and most important commercial centre, travel to Pyay where you will board the newest custom built ship on the Irrawaddy, Scenic Aura for a very special 11 day voyage. Fly from London Heathrow Or Manchester with Singapore Airlines to Mandalay via Singapore. Welcome to Mandalay. Enjoy the magnificent sunset views from Mandalay Hill before your welcome dinner and an overnight stay. Enrich: Learn how to produce gold leaf at a local workshop. At Mahamuni Pagoda, male guests may place the gold leaf on the iconic Buddha statue. Afterwards board Scenic Aura and enjoy tonight’s welcome reception whilst cruising to Mingun. In Mingun discover the stories behind a massive unfinished brick pagoda. Nearby, admire the un-cracked Mingun Bell and the all-white Hsinbyume Pagoda. Sundowners: Enjoy an evening drink in boats under U-Bein Bridge, the world’s longest teak bridge, to capture that memorable photo of the bridge at sunset. In the ancient capitals of Sagaing and Inwa, spiritual enlightenment awaits. Enrich: In Sagaing interact with novice monks and nuns during a special visit to a monastic supported school before continuing to a quiet nunnery where you will partake in our donation to the resident nuns before their midday meal. Later by horse and cart, explore Inwa, for more than 400 years the capital of the Ava Kingdom. Visit a 200-year-old teak monastery, the leaning Inwa Tower and remains of Inwa Fort. Sail to Myinmu and drive across the countryside through Monywa to explore the sandstone grottoes decorated with spectacular mural paintings and hundreds of Buddha statues inside niches. Return to the ship and continue your cruise to Yandabo. Arrive in Yandabo where in 1826, the peace treaty ending the First Anglo-Burmese war was signed. Now famous for its pottery, stroll through the village and witness the craftsmen honing their craft and observe their unusual way of firing the pottery. En-route to Bagan, stop off at the traditional riverside village of Schwe Pyi Thar. As the day progresses, enjoy demonstrations about the traditional dress Longyi and the time-honoured face decoration that is Thanaka. 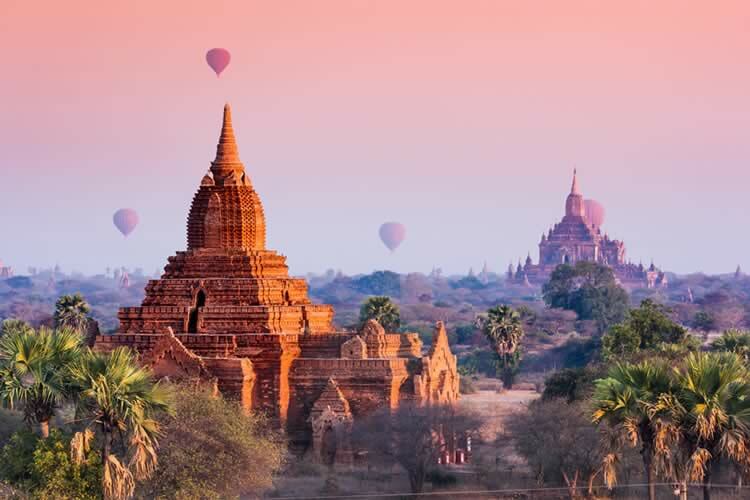 Optional Hot Air Balloon Flight - Take a hot air balloon flight over the majestic temples of Bagan. Flights last approximately 45 minutes and must be purchased prior to your cruise to guarantee availability. (Plese note: available only from late-October to mid-March; all flights weather permitting). Freechoice: Venture to Mount Popa, home to Myanmar’s nats or nature spirits, before heading to a Toddy Farm where a traditional lunch awaits. Alternatively, explore the markets at Nyaung U before either exploring the Temple Circuit, or enjoying a visit to Old Bagan. Afterwards, visit the most iconic sight of this hypnotic region, the impressive Ananda Temple. Sundowners: Travel to Clay Pot ‘mountain’ and indulge in a relaxing drink while soaking up magical views over the Bagan plain. Tonight attend a traditional string puppet show. Enrich: Rise early to attend morning alms for the local monks and be invited to eat mohinga, a traditional breakfast with the local people. Later travel by horse cart through a local village and the temple ruins before learning all about the production of Burmese lacquerware. Later continue cruising downstream to Salay. On your walking tour explore Paya Thonzu, a small trio of brick shrines, admire Youqson Kyaung, a beautiful teak monastery and look inside the largest lacquer Buddha image in Myanmar. Enrich: From the river front, soak up the ambience of the river and the colonial feel of the town whilst enjoying traditional local Burmese tea and snacks in a restored colonial villa dating from 1906. Enjoy the morning sailing to Magwe, where in the cool of the afternoon you will experience a tour of the town by trishaw. Take in the views from Mya Tha Lun Pagoda, a mesmerising architectural vision set on Naguttama Hill. An afternoon of exploration awaits in Thayetmyo, which once marked the border between Royal and British Burma. In this quaint port town you can try your hand at putting on a green at the oldest golf course in Myanmar, admire the region’s old colonial buildings and explore the gems at the local market before returning to the ship. Berth in Pyay later this morning. Begin with a visit to Shwesandaw Pagoda which contains a series of five terraces. In the afternoon explore Sri Ksetra, one of the ancient Pyu Kingdoms that flourished between 200 B.C. and 900 A.D. and became Myanmar’s first World Heritage-listed Site in 2014. Later, enjoy a farewell dinner back on board. Disembark with a picnic lunch and drive to Yangon. Stop in Htaukkyant to visit the Allied War Cemetery. Continue to Yangon to enjoy your two night Special Stay. Freechoice: Hunt for gifts and handicrafts at Bogyoke Aung San Market. Alternatively, embark on a guided tour of Yangon’s art scene, or cross the Yangon River by ferry to Dhala village. Explore the cobbled streets of Yangon, view the enchanting Kandawgyi Lake and Yangon’s largest reclining Buddha. Enrich: As the sun sets, wander around Shwedagon Pagoda and learn about the ritual of ‘oil lamp lighting’ before partaking in this local tradition. Enjoy tonight’s farewell dinner. Say goodbye to Myanmar. Transfer to the airport for your overnight flight to the UK. Discover the village of Myinkaba, famous for its laquerware workshops. Terms and conditions apply. All offers are subject to availability and operators booking conditions. Prices are based on two passengers sharing the lead in grade stateroom unless otherwise stated. All discounts have been applied to fares displayed. ^Itinerary operates in reverse, please call to confirm. †All drinks included except fine and rare wines and spirits. *Savings of £1,000pp are valid to new bookings only made by 30th November 2018*. Offer can be withdrawn at any time. We charge a one-off small £20 booking fee. That’s it - nothing more and no add ons when you pay the balance. E&OE. ABTA P6710.